Montiff All-Basic full spectrum Amino Acids formula is not only the purest and most potent product of its kind - it is the most VERSATILE! Montiff All-Basic protocols: let me count the ways..! Take in the morning on empty stomach with some water or juice. Take before, during or after a meal. Starting slowly with 2 - 4 capsules per day, you may build up to a therapeutic dose anywhere from 6 - 20 capsules total per day, creating a balanced foundation for health and healing. **NOTE: Vita-Minz Plus and/or B-Complete should be added for long term protocol (vitamins - particularly B-Vitamins - and minerals - are needed to balance Amino Acids. A good general protocol would be 1 Vita-Minz Plus for every 3 - 4 capsules All-Basic. A unique blend of 20 highest quality L-Crystalline singular Amino Acids, plus precursor Ornithine-α-Ketoglutarate and antioxidant Alpha Lipoic Acid. L-Lysine HCL, L-Isoleucine, L-Glutamine, L- Tyrosine, L-Threonine, L-Alanine, L-Leucine, L-Histidine, L-Arginine HCL. L-Aspartic Acid, L-Valine, Ornithine-α-Ketoglutarate, L-Methione, L-Cystine, L-Glutamic Acid, Glycine, L- Phenylalanine, Alpha Lipoic Acid, N-Acetyl-L-Tyrosine, L-Serine, Taurine, L-Proline. Montiff All-Basic: Why so Important? Amino acids are the building blocks of protein, and are vital to understanding the Kreb Cycle. They are individual crystalline molecules that make up protein, similar to the way letters make up the alphabet. There are 20 basic amino acids that produce over 1600 substances in the body. They make up 3/4ths of the body’s solid material, and are found in muscle tissue, organs, blood and skin. Amino acids also make hormones, enzymes, and vitamins, and are essential for a healthy immune system and proper neurological functions. It is necessary to replace amino acids constantly to nourish the body, and repair and regenerate tissue. Amino acids are generally ingested in the food we eat, however, because of processed foods, inadequate diets, and food restrictive programs, proper balance is rarely achieved and supplementation is advisable. Especially during illness, trauma, surgery and stress more amino acids are required than can be obtained by food alone. In the chronically ill, they can help reverse negative nitrogen balance, and help prevent tissue wasting. 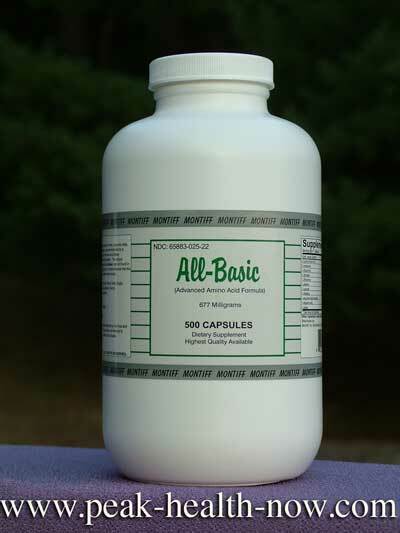 ALL- BASIC is the recommended choice to help insure optimum balance and provide basic amino acid requirements. • Periods of ILLNESS, INJURY AND STRESS when additional amino acids are required by the body for tissue and cell growth and repair. • Helping to stimulate the immune system. • Assisting in reversing negative nitrogen balance. • Prior to and after surgical procedures. • Providing a balanced nutritional program, especially for restricted food programs including food allergies. DIRECTIONS: 1-4 Capsules T.I.D. (3x Daily) 30 minutes before meals with full glass of fruit juice or water. **Do not take with milk or hot fluids. Montiff Vita-Minz Plus and B-Complete are recommended. • Highest quality L-Crystalline singular amino acids readily available for proper utilization and metabolism. • TAURINE for heart support, antioxidant properties and neurological health. production which is important for endothelial cells. • LYSINE which is low in vegetarian diets, may inhibit viruses such as Herpes and EBV, and is found in muscle and connective tissue. ALL-BASIC formula has proper Lysine to Arginine balance. • L-TYROSINE AND N-ACETYL-L-TYROSINE which crosses the blood brain barrier quickly, to elevate catecholamines (which are generally low in depression), and for proper neurological balance. • BRANCHED CHAIN AMINO ACIDS, LEUCINE, ISOLEUCINE AND VALINE in proper balance for healthy muscle tissue. • GLUTAMINE for muscle tissue, neurological and gastro-intestinal health, supporting the immune system and promoting proper glucogenic function. • GLUTAMIC ACID important for neurological health and is precursor to GABA. • ALANINE helps stabilizes blood glucose levels. in surgical, trauma and leg ulcer patients. • PROLINE is major amino acid found in collagen and cartilage and is important for maintaining youthful, healthy skin as well as maintaining and repairing connective tissue for joint care. It is also essential for the immune system. • METHIONINE prevents deposits and cohesion of fats in the liver due to lipotropic factors, and assists in proper gallbladder function. It also has powerful antioxidant properties. problems such as psoriasis and eczema. • ASPARTIC ACID helps in protective function and detoxification of the liver. useful in conditions of lethargy and extreme mental fatigue. health and is involved in the central nervous system. It is essential for bile acid metabolism and is a biochemical constituent of the tripeptide Glutathione, which is an important antioxidant. 1. Blackburn, G.L. Grant J.P., Young, V.R., “Amino Acids Metabolism and Medical Applications”, 1983. 2. Rose, W.C. “Journal of Biological Chemistry” 1955. Vol.45, No. 8, Oct. 1998. 5. Somogy J C, Hotzel d., eds, “Nutrition and Neurobiology”, 1986. 6. Chaitow, L. “The Healing Power of Amino Acids”1989. 7. Buzettu F., ed.’ Nutrition in Cancer and Traumaseosis”, 1985. 8. Rattenbury JM., “Amino Acid Analysis:”, 1983. 9. Latifi, Rifat, M.D.,”Amino Acids in Critical Care in Cancer”. 1994. 10. Cynober, Luc, A., ”Amino Acid Metabolism and Therapy in Health and Nutritional Disease”, 1995. 11. Lovenberg, William, “Nutrition Reviews”, 1986. 12. Gibson, C.J., Gallenber, A., “Advanced Bio-Psychiatry”, 1980. 13. Packer,L., Trischler, H.J. ,”Alpha Lipoic Acid –The Metabolic Antioxidant”, “Free Rad. Bio. Med.”,20:, 1996. 14. Mathews C.K., Van Holde, K.E., “Biochemistry 2nd Edition:, 1995. 15. Panza, J., M.S. Cannon R., M.D. et al editors; Endothelium, Nitric Oxide and Atherosclerosis, 1999. Montiff inc.Copyright 10/2000© (used with permission from Montiff).